The cotton plant is grown in over 80 countries worldwide and uses approximately 2.5% of the Earth’s cultivated land. The cotton fiber is the world’s most widely cultivated and produced natural fiber and is used in everything from clothing and personal care products, to the mattresses we sleep on.1 The vast use of cotton has pushed the agricultural community to produce up to 24.8 million metric tons of conventional cotton annually. 2 Organic cotton is being produced on a much smaller scale, in approximately 22 countries by 220,000 farmers; producing up to 175,113 metric tons annually. 3 Cotton is used in most of the products we sell at The Natural Sleep Store. From organic bedding, to organic mattresses, cotton is our most used material. Due to the popularity of cotton, it is important to look at the practices used throughout the lifecycle of the plant. This article will explore the lifecycle of conventional cotton and organic cotton, from the sowing of the seed to a finished fabric, along with the impact each is having on human health and the environment. Through comparison we will uncover the practices in conventional cotton farming that are destroying our environment and its inhabitants, and show how organic cotton farming is promoting heath and stability. Organic farming is based on a respect for the environment and the people who inhabit the earth. In organic cotton farming the process is organic from beginning to end, starting with an untreated seed and soil that has not had conventional farming for at least three years. All-natural processes are used to boost the yield of the crop and to regenerate the soil productivity. There are many techniques used to deter pests, replenish topsoil fertility, and improve the ecosystem within the soil and around the crop. The practices that achieve these goals are cover cropping, crop rotation, and trap cropping. 4 Cover cropping is when a plant, often in the legume family, is planted on the soil in the off season or during crop rotation. Nitrogen is plentiful in the Earth’s atmosphere but is very rare in soil. Legumes are nitrogen fixing plants that increase the amount of nitrogen in the soil by taking it out of the atmosphere and depositing it in the soil through its roots. 5 The cover crop also helps to prevent soil erosion. Crop rotation is the process of rotating crops systematically to help build healthy soil. Using a crop rotation helps retain water in soil due to the soil’s higher amount of organic matter, and the rotation simply gives the soil time to replenish its nutrients. 6 Trap cropping is a way to deter pests from a crop by planting a different plant in a row next to the desired crop. By luring the pests to the other plant the cotton is kept safe. Weeds are simply controlled by weeding the fields by hand or with small hand tools. A seed planted in soil is the first step to the growth of any living plant. In the case of conventional cotton the seed is the first step in which the agricultural industry and farmers can modify the cotton plant.7 The majority of the cotton seeds planted in the United States are genetically modified organisms or GMOs. The cotton seed is altered to carry a bacteria Bacillus thuringensis, also known as Bt cotton, which is a measure of pest control and prevents bollworms from feeding on the plant. Cotton seeds are also treated with fungicides or insecticides before being planted to insure a greater germination percentage, which is just the beginning to the use of chemicals in conventional cotton farming practices. Soil fertility is a leading problem in the practices of conventional cotton farming. The soil on the cotton farms quickly becomes degraded and sterile due to the cotton monoculture. A monoculture is when a single plant species or crop is planted on a large amount of agricultural land year after year. The monoculture of conventional cotton leads to a lack of organic matter and a non-complex ecosystem within the top soil. The barren soil requires extensive amounts of irrigation to retain the water provided as well as synthetic fertilizer. 8 The synthetic fertilizer used to increase soil fertility is an anhydrous ammonia (NH3) which has an extremely large amount of nitrogen. When the cotton growing season is coming to an end conventional cotton farmers do not rely on natural processes to defoliate the crop. Chemical defoliants are sprayed on a plant to make their leaves fall off prematurely, and are also sprayed on the cotton to make the bolls open. 12 Cotton fibers are encased in bolls during the growth of the plant and under natural circumstances the fiber would help in the seed dispersal, similar to a dandelion seed. The defoliants used in cotton farming are very similar to Agent Orange used in the Vietnam War. What does this all mean for the health of humans and our environment? The extremes of conventional cotton pollution have been multiplied as science has created more toxic, potent chemicals and as the demand for cotton has grown. Many of the conventional cotton farming practices described above have life threatening consequences to humans, wildlife and the environment. The most alarming truths of cotton farming include its monoculture, the synthetic fertilizers, the persistent pesticides, the defoliants used, and the chemical processes used to finish the cotton. From a cause and effect perspective, the next section of this article will describe the effects of the chemicals and practices used in conventional cotton farming. In conventional cotton farming when a single crop is planted on a plot of land year after year the soil becomes degraded; devoid of all organic matter or a complex ecosystem. The lack of organic matter makes it impossible for the water from rain or irrigation to be absorbed into the soil. Since water retention is so low, extensive irrigation is required. The irrigation causes salinization, which is when salt levels in the soil rise. As a result of a monoculture, the barren soil has large amounts of run off which usually ends up in the rivers and fresh water sources that surround the fields. 16 The second repercussion from a monoculture is that due to the lack of organic matter in the soil the land will not produce a viable crop without the use of synthetic fertilizers which are nitrogen based. The problem of run off and the use of synthetic fertilizer then exacerbate the negative effects of each other. The cotton crop depletes the nutrients in the soil year after year, which leaves the soil barren and results in run off. The run off carries the nutrients away and makes added fertilizer a necessity. Thus when the enormous amounts of fertilizer are used it is also present in the run off into our streams and rivers. The presence of the nitrogen in the runoff has devastating results. Some of the negative repercussions of using synthetic fertilizers include nitrogen contaminated lakes, rivers, and oceans, death of fish and other aquatic species, nitrate-contaminated drinking water which can be fatal to babies and cause health complications in children and adults, oxidized nitrates that cause smog and deplete the ozone layer, the usage of large amounts of non-renewable fossil fuels, and it makes soil weak and the plants that grow on it even weaker. 17 Although there is a long list of known impacts to the environment, wildlife, and human health it is very possible that there are unknown impacts that scientists will learn more about as we move into the future. Persistent pesticides are scary because they are stable in the environment and they do not break down over time, which means it can be stored in living fat tissue and can be passed to other animals higher in the food chain. You do not need to live close to a farm for this to be true for you. In a study by the CDC (Centers for Disease Control and Prevention), 1,342 people were tested for 23 different pesticides. A startling average of 13 pesticides were found in each person. Furthermore, at least 3 of the 23 pesticides in the study were found in 100% of the 1,342 people tested.22 This shows that the overall use of pesticides, not just direct exposure, can have long term and escalating problems within the food chain and environment. After exploring the differences between conventional cotton and organic cotton it is clear that their biological life cycles are the same whereas the way in which they are farmed, harvested and processed is quite different. Organic cotton farming is kind and forgiving to the environment, while also helping to provide a sustainable Earth for humans and wildlife to continue thriving. Conversely, conventional cotton farming is degrading our soil, poisoning our youth, and destroying our planet. This matter is not one of little scale or small importance. In fact this matter is one that should be on the forefront of civilians and farmers minds alike. The most important concept to take away from reading this article is that you, the consumer, has a choice in the clothes you wear, cotton products you purchase, and especially the mattress you sleep on for a third of your life. Please purchase organic cotton organically because every little bit helps. 1 Food and Agriculture Organization of the United Nations. Natural Fibers: Cotton. http://www.naturalfibres2009.org/en/fibres/cotton.html. 2 USDA. World Cotton Production Chart in Tons. http://www.cottoninc.com/corporate/Market-Data/MonthlyEconomicLetter/pdfs/English-pdf-charts-and-tables/World-Cotton-Production-Exp.pdf. 3 Organic Trade Association. Organic Cotton Facts. http://www.ota.com/organic/mt/organic_cotton.html. 4 Abraham Asare, Nkafu Patrick Asonganyi, Elenora Cogo, Anne Mette Dalum, and Lis Nowak, Life Cycle Assessment of Organic Cotton ( University of Aalborg, 2006), 1-13. http://people.plan.aau.dk/~lnow04/Life%20Cycle%20Assessment%20of%20organic%20cotton%202-12.pdf. 5Organic Valley Family of Farms 2013. Synthetic Nitrogen Fertilizers. http://www.organicvalley.coop/why-organic/synthetic-fertilizers/. 6 About Organic Cotton. Organic Cotton is Different. http://www.aboutorganiccotton.org/. 7 ICCO, SECO, Textile Exchange and HELVETAS Swiss Intercooperation. The Cotton Value Chain. http://www.organiccotton.org/oc/Cotton-general/Cotton-value-chain/Cotton-value-chain.php. 8 About Organic Cotton. Cotton is Different. 10 Sustainable Cotton Project. Got Cotton?. http://www.sustainablecotton.org. 11 Asare, Asonganyi, Gogo, Dalum, and Nowak. Life Cycle Assessment.(1-13). 12 Mississippi Agricultural and Forestry Experiment Station. Cotton Production in Mississippi: Defoliation General Discussion. http://msucares.com/crops/cotton/discussion.html. 13 Asare, Asonganyi, Gogo, Dalum, and Nowak. Life Cycle Assessment.(1-13). 14 Department of Human Health and Human Services, National Toxicology Program, Report on Carcinogens, Twelfth Edition, 2011. 62, http://ntp.niehs.nih.gov/ntp/roc/twelfth/profiles/BenzidineAndDyes.pdf. 15 B. Ramesh Babu, A.K. Parande, S. Raghu, and T. Prem Kumar, “Textile Technology Cotton Textile Processing: Waste Generation and Effluent Treatment,” The Journal of Cotton Science 11, (2007): 141. 16 ICCO, SECO, Textile Exchange. Cotton Value Chain. 17 Organic Valley Family of Farms 2013. Synthetic Nitrogen Fertilizers. 18 U.S. Environmental Protection Agency, Pesticides, 2013, http://www.epa.gov/pesticides/. 19 About Organic Cotton. Cotton is Different. 20 Institute of Science in Society, Picking Cotton Carefully. http://www.i-sis.org.uk/Picking_Cotton_Carefully.php. 21 Pesticide Action Network, Problems with Conventional Cotton Production. http://www.panna.org/resources/cotton. 22 Center For Disease Control, Fourth National Report on Human Exposure to Environmental Chemicals. http://www.cdc.gov/exposurereport/pdf/FourthReport.pdf. 23 Pesticide Action Network, Pesticides in Our Bodies. http://www.panna.org/issues/persistent-poisons/pesticides-in-our-bodies. 25 Kope Textiles and Initiatives, Organic Cotton. 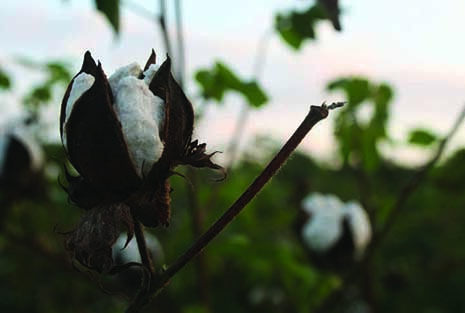 http://www.kopeinitiatives.in/organic-cotton-facts.html. 26 Babu, Parande, Raghu, and Prem Kumar, “Textile Technology Cotton Textile Processing: Waste Generation and Effluent Treatment,”. 27 Department of Human Health and Human Services, National Toxicology Program, Report on Carcinogens, Twelfth Edition. 28 Hanu, Organic Textiles. http://dyeingworld1.blogspot.com/2010/01/organic-textiles.html. 29 Babu, Parande, Raghu, and Prem Kumar, “Textile Technology Cotton Textile Processing: Waste Generation and Effluent Treatment”.